When I was doing my research for the Month, there were several posts and articles I came across that I thought you guys might be interested in. An NY Time article about the various identities/labels there are and whether the acronym should be made longer, and how university LGBT groups are primarily "LGB" and don't seem to be as inclusive for other identities. A Montreal Gazette article about the possibility that "waving the LGBTQ flag" /"wearing" a label says "different" when LGBTQ people are fighting for equal rights. Before I carry on, I am a little confused. Swingers? I could be wrong, but I thought that was a preference, a choice made, where as sexuality and gender identities aren't a choice. I don't really get why swingers would be included. Perhaps someone would like to explain it to me? Laura Lam, author of Pantomime, guest posts over at Gay YA to discuss non-binary gender identities in YA. Authors of LGBT SFF recommend other LGBT SFF titles. Christa held her own YA Pride Month in June! Check out the schedule linked for all the reviews and interviews. YA author Malind Lo held her very own YA Pride Month on her blog last year. She will also be holding YA Pride in October this year. 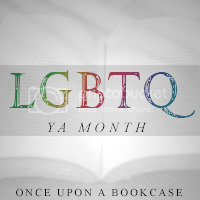 The link goes to the "YA Pride" category, so all posts for the both Months can be found there. FSG authors on the books that helped them come out (not a YA post). Thanks to Emma for sharing this link. Jennie of YA Reading List lists her top ten GLTBQ books released in 2013 for Pride Month in June. Molly of Wrapped Up in Books also listed ten recent favourite LGBTQ YA novels for Pride Month in June. Jack Radlish's list of trans YA. Thanks to Charlie Morris for sharing this link. List of LGBT fiction from picture books to YA by Elizabeth Chapman. Thanks to Charlie Morris for sharing the link. The Chartered Institute of Library and Information Professionals has a list of LGBT books from picture books up. Thanks to Emma for sharing. Tea and Glitter is a blog run by Eveleena Fults I stumbled across when doing some non-book related blog reading. Eveleena is an out and proud lesbian, and has some truly awesome, inspiring and beautiful posts on her blog sharing advice with those who ask for it. Here are a few of her blog posts that I thought might be really helpful for any young gay/questioning teens reading. Response to "I'm Extremely Conflicted About My Sexuality." "Does every girl have that "I'M GAY" Moment?" Eveleena's Thoughts. How to make it clear you're interested in girls as a femme lesbian.